At the age of 80, Halima sits thoughtfully as she holds her walking stick, her head tilted sideways in a quiet gaze. She is one of the participants at the community sales mobilization meeting the Takaful Insurance sales team and I are holding today at Sankuri division in Garissa County. She may not seem to understand the explanations because of the complex IBLI concepts, but all she knows is that we are here to talk about how to overcome the effects of drought, a challenge she has dealt with numerous times throughout her life. Halima is a widow, and like many other women of her status, she is representative of poor, female headed households, which are the most vulnerable to the negative effect of climate shocks and are most times left poorer after experiencing such shocks (World Bank, 2001). Halima sits in the meeting among male elders and asks questions if she likes, which is not a privilege extended to many of the younger women, as the cultural norms in this area do not allow for women of a certain age to attend such meetings, and even if they do, they are required to stand (not sit) some distance away from the men and only speak when asked to – an opportunity most are often reluctant to accept. 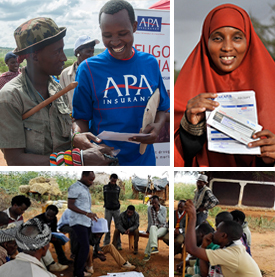 A similar situation occurred in Isiolo County while conducting door-to-door sales mobilization, which is a method of community mobilization that the Takaful Insurance of Africa (TIA) team sometimes uses in order to be able to find men at home before they head to the market or to take their livestock to graze. Out of the 7 households where the team talked to women, five said they did not have money to buy, while one said she had the money but she is not allowed to “decide” to buy unless she gets permission from her husband. The only one who purchased was a woman named Fatuma, a widow over eighty years in age, who insured 5 goats. She said she wanted to try out IBLI with her purchase of coverage for the 5 goats, but elaborated that she would be willing to pay more if she saw how index based livestock insurance works over time (i.e. if it pays out accordingly when she believes there is a drought and her livestock are suffering). However, the role of gender politics is not the same across Northern Kenya. In fact, a slightly different scenario played out in Danabe located in Gurar division some 140 kilometers North of Wajir town. Having made about two stops on our way here, the team arrived at the Danabe market late in the evening, where people were still milling around the market, making purchases for their evening meal. The elders had been waiting for us at the chief’s office, some playing a game of draughts amidst heavy sneezes, which usually comes with a prolonged clearing of the throat and finally a long distance spit, a clear effect of the traditional snuff they ingest from time to time. The area chief quickly gathered everyone around and just when we were ready to start the meeting, he told us to hold on a minute. He had sent someone to gather the women to come for this meeting, most of them had to leave buying and selling their merchandise to attend the meeting. Unlike the other places we had visited, the area chief in his opening speech said that the men should allow the women to take part and even quoted the issue of equality as per the Kenyan constitution. Indeed, the women here stood within the circle, and they were permitted to ask questions and seek clarification, just as their male counterparts. 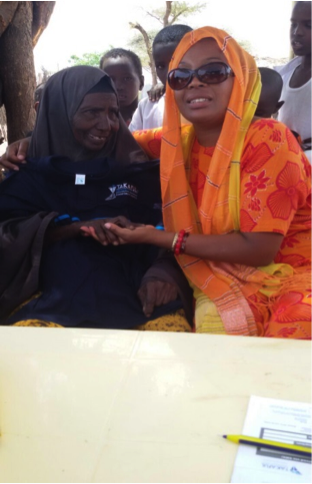 Women in Wajir may not purchase substantially more than their counterparts in different regions, but such deliberate efforts encouraging their participation may lead to increased IBLI purchases by women. With these experiences in mind, one observation from the community sales mobilization is that in some areas older women are in a better position to make purchasing decisions, while younger women tend to defer to their husbands, many of who may have been away finding forage for their animals or had already left for the market. This is as a result of cultural dynamics where some clans are still firmly holding to their cultural beliefs while others are slowly breaking these cultural barriers. Sometimes women are willing to purchase IBLI, but have no liquid cash with them, as most of them do not have control over expenditure in the household. Income generated at the household level is under control of the men and therefore they make decisions about it. Women headed households can however make their own decisions, like in the case of Fatuma and Halima who are both widows. Women still suffer from gender-specific drawbacks (Ransom and Bain 2011) when it comes to accessing such climate change adaptation strategies as Index-Based Livestock Insurance, and there is still more that needs to be done to overcome these cultural barriers. Involvement of community leaders and government officials such as the Danabe chief in a more structured manner could lead to more women purchasing Index Based Livestock Insurance. The questions that come to mind is whether Index-Based Livestock Insurance extension and training can formulate meaningful and inclusive ways of ensuring women’s participation. Secondly, how much influence can women have on their husbands or as household heads over their decision to purchase IBLI for the sake of overcoming adverse effects of drought?